Sign up NOW to SELL! Your account can be used at all JBFs! Bring your items to Drop-Off at the day & time shown below. After the sale, either pick up your unsold items OR stay home and let us donate them to our local charity. We mail your check 2 weeks after the sale has ended! 2. Read PREPARING YOUR ITEMS below. The Tagging Videos are great, too! Consignors earn 60% on sold items, minus a $10.00 consignor fee, which is deducted from your check. If you Volunteer for at least 4 hours, you earn 70% on your items sold, minus a 10.00 consignor fee. Plus, you get in early to the Pre-sales! Click here to print your Consignor Waiver & sign it before you arrive at DROP-OFF!!! It saves time! Bring a Stamped/Self Addressed envelope, please. (A $1 fee will be charged if you are not able to bring this). For Full Sale Schedule, see below. Sign Up to Volunteer at the sale and earn 70% on your sold items ~ You can get in early to the Pre-sales too! Join other smart & savvy Consignors who volunteer shifts in exchange for early shopping privileges & an extra 10% on their gross sales. Please note, only Consignors can be Volunteers. Please remember that you need to be comfortable. We recommend wearing close-toed shoes that give you alot of support. And please wear clothing that lets you move easily. We really depend on our Volunteers. If you sign up, we are counting on you to fulfill your commitment. If you need to cancel your shift before the sale begins, please log in to our website and cancel the shift so others will have to opportunity to sign up for the time slot. If you have an emergency come up during the sale, please email Victoria at JBFMCKINNEY@gmail.com. 1.Bring your items tagged, prepped & sorted by gender & size. 2.Bring your signed Car Seat Wavier, and Crib Waiver (if needed) & self addressed/stamped envelope to save yourself time! Links for those waivers are below. 3. You will place your items on the sales floor, as directed by our Volunteers. **Don't have time to put your items out? Sign up for our Express Drop-Off service! For a fee, we'll get your items from your car, inspect them, and place them on the floor for you! -The fee is: 20.00 for 1-100 items, 30.00 for 101-200 items, 40.00 for 201-300 items, etc. By appointment only. Please select your time from our SignUpGenius. Clothing will be sorted by Consignor number for easy pick up. As time allows and depending upon how many Volunteers we have, we will continue to sort other items by Consignor number. Please check the Lost and Found Table and the Items with No Tag area. Your check will be mailed to you after the completion of the sale. If you are unable to pick up your unsold items, please make arrangements with someone to pick them up for you. That person must have your approval (sent to us by email or on phone) and/or personal ID (driver's license). At 9:01pm remaining items are donated to Frisco Family Services charity. Sorry, no exceptions. We are not able to take and store any left-over items for Consignors. Donations are greatly appreciated! Use cardstock to print your tags on. We accept ANY TYPE of HANGERS that are size appropriate. Please secure safety pins at the seams of garmets, so it doesn't place holes, in example, the middle of a shirt. Toys are popular sellers at JBF sales. All toys must be checked for safety recalls before consigning. Clean all toys thoroughly and please test to make sure that toys and equipment are working properly. Make sure toys contain all working parts. Battery operated toys must include working batteries (these can be purchased inexpensively at the Dollar store). **JBF McKinney now only accepts stuffed animals of name brands ONLY (FAO, Disney, Jellycat, etc) They MUST BE CLEAN/WASHED!! LIMIT OF 5 PER CONSIGNOR ONLY!!!! Package: Keeping tags and multiple items attached is essential for your items to sell. Bag all small parts belonging to toys/equipment in Ziplock bags and tape the bag shut with clear packing tape. Fasten the bag securely to the item with ribbon, tape, or zip ties. At JBF we recommend pricing items at 1/3 to 1/4 of retail. Tag: Attach JBF tag directly to item with clear packaging tape or hole-punch JBF tag after putting clear tape on the top, and tie or zip-tie it to item. If you are selling a big packaged item, it is very helpful to attach a picture to the front so the shopper can see the contents. Games and puzzles must have all pieces. (No “adult content, please.) Check items to ensure they are in great condition. Package: Use clear, Ziplock bags or clear cling wrap (saran wrap) to hold multiple items together; Tie sets of books together with ribbon/string. Be sure that parts/games to video game systems (such as Vtech) cannot be separated or switched out at the sale. Price: Prices start at $.50 & go up in this category, depending on the item. If you would like a high-priced item placed on the High Value Case next to checkout, please see a Team Leader during Drop-Off. Tag: When tagging books, please attach your tag to the book with clear tape that can be removed without damaging the item. Blue Painter's Tape works great too! Please do not use masking or double sided tape. For sets or bundles of books, please place them inside a large zip-lock bag or wrap them several times with clear, plastic wrap and then secure the tag to the front of the books. Nursing Items, feeding items, monitors, safety items, diapering & toileting items, rattles, and more. Please check for safety recalls on all items that you consign. No used pacifiers or infant toothbrushes, please. Package: If item has multiple pieces use packaging tape, safety pins or Ziplock bags to keep items attached together and clearly visible to shoppers. Please - only new pacifiers in a package will be accepted. Batteries must be included, if applicable. Tag: Attach JBF tag directly to item or Ziplock with clear packaging tape or hole-punch JBF tag and tie it to item or safety pin to item. A Magic Eraser works great to clean up shoes to look their best! Tagging: Zip ties or curling ribbon work great to secure shoes together. Punch two holes in the top of the tag to run the tag through tie or the ribbon. Smaller shoes or shoes that are hard to attach together can be put in a gallon Ziplock bag. Shoes tend to easily be seperated from their original shoe boxes so please leave the boxes at home. Bedding sizes accepted are bassinet through twin only. We DO NOT accept crib bumpers or bedding with 'batting'. Please be selective when selling bedding, blankets, receiving blankets, burp cloths, and towels. New and barely used items sell best. Check carefully for stains; shoppers get very disappointed if they find a stain in a bundled blanket once they get home. Please hang blankets as they sell best this way! Blankets can easily be hung over the cardboard bar of a pants hanger. Price: Price items 1/4 of the retail price. Tag: Attach JBF tag directly to item with clear packaging tape or pin to the item. 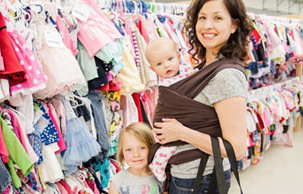 Diaper bags, infant carriers, backpacks, lunch boxes and kid's purses are great consignment items. Please inspect all items carefully to make sure items have not been recalled, stained, damaged or are missing pieces. Package: Please zip-tie items to an adult-size hanger. Price: Price 50% - 75% off retail. Items in great condition tend to sell very well. Tag: Hole-punch JBF tag and attach it to item with a safety pin, ribbon, string. If an item contains multiple pieces, be sure all pieces are included and list number of items on JBF tag description. Be picky. 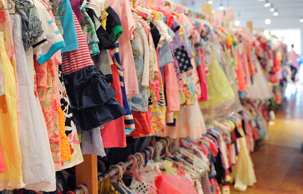 Look at your clothing items as if you were going to purchase them for your children. No stained or damaged items will be accepted. Please bring freshly cleaned clothing items. Replace missing buttons, sew loose hems and seams, and clip loose threads. Remember to button all buttons, snap all snaps, zip all zippers before you arrive at drop-off. This will ensure that the clothes you are hoping to sell will look their very best! The newer the item looks and the better it smells, the better it will sell. Hangers : Please hang clothes so the hanger hook points to the left (like a question mark). Please hang size 0-4 clothing on child-size hangers if possible. Infant clothes hung on adult hangers makes it very hard for a shopper to see its true size. You want your item to sell and look the best it can! Clothing that falls off the hanger onto the floor does not sell well-or at all! Old Navy and many outlet stores are great places to get free hangers. Wal-Mart & Target sell child-size plastic tube hangers at a great price. Clothing Sets: Sets tend to sell better (under size 6) so match things up if you can. Again, all garments should be hung with the hanger hook pointing left (hanger should resemble a question mark when looking at the front of item). Safety pin to attach clothing sets securely with bottom garment hung on the backside of the shirt at the top of the hanger. This is the best way so both pieces can be viewed without separating them.Onesies and Sleepers must be hung on a hanger. Clothing items in baggies will be charged $1.00 per bag to be put on a hanger and tagged. Sports Uniform Shirts and Tshirts: We can NOT accept personalized little league sports shirts, Upwards, Vacation Bible School, Elementary spirit wear type shirts. These types of clothing items will not sell! Pants/Shorts : Pant-clip hangers are great but if you use a standard hanger, simply use two safety pins to attach the waist of the pants to the top part of the hanger ( the 2 slanted sides), then place tape over the pins to prevent sliding. Are you a Power Seller? *We have a 750-item limit at this event, NO EXCEPTIONS!!! If you have 500-750 total items you're bringing to the sale, congratulations you are now a Power Seller! *In order for drop-off and sorting to run efficiently, we require our Power Seller’s to work an 8-hour Sorting Shift the last day of the sale (Saturday 12-8pm). You may schedule your shift through our online volunteer scheduling system. *During this time, you'll be helping us sort ALL consignor’s items, ensuring this big job gets done in time. Have items you'd love to get some cash for, but are too busy to tag? Being a Valet Consignor is for you! 1. Sign up ASAP! Limited spots are available. Register online and get a Consignor number. 2. Contact us at JBFMcKinney@gmail.com to reserve your spot. Deadline to sign up is July 1st! 3. Deliver your clean, sorted clothes/toys*/items to the designated Valet Tagger by the appointed date. 4. You pay a $15 supply fee (per 200 items) and pay the Valet Tagger $.50 for each item upon pickup from Valet Tagger. 6. $10 consignor fee will be deducted from your check You earn 60% of your sold items (70% if your volunteer). 7. Pick up your unsold items on Saturday, 8pm-9pm OR just leave them with us and know that we will DONATE your items to Frisco Family Services!! You will be given a pre-sale pass to attend the Consignor PreSale. *Items must be free of stains, and toys must have all working parts and batteries. Unacceptable items will be returned to the consignor or donated after the sale. Want to Join our Team and Shop FIRST?? Volunteer 20 hours (plus 1 marketing task before the sale) and you can be a Team Leader too!! You will recieve a shirt, all meals provided, $40 in JBF bucks, flexible volunteer schedule, and you'll be a part of an AMAZING group of women who make this event possible!! Email Victoria at victorialehr@jbfsale.com to apply! 2pm-9pm PrimeTime Shopping $10 Cash/adult This is AVAILABLE to the PUBLIC until 9pm ** Free Admission Coupons NOT Accepted during this Pre-sale. 6:00pm-9pm PrimeTime Half-Price Sale OPEN TO THE PUBLIC for a $5 Cash Admission Items without a Star are Half-Price!! Saturday, August 3rd: HALF PRICE DAY!!! 8:00am-1:00pm Public Shopping FREE ADMISSION! Items without a Star are Half-Price!